Remember back in the late 70’s when they used to show a commercial with a skillet on a stove with eggs frying in it and the sound bite was ‘THIS IS YOUR BRAIN ON DRUGS!” Sooo scary! Fast forward thirty years and you see a malformed CANKLE resting on a couch. “This is your foot after a 12 hour day running all over Christ’s creation to get a show up and running”. It looks much worse than it is – really…and it’s only one. The other is just fine…odd. I know. Just seems ironic that these days I pop 13 pills every morning to be healthy and instead of frying my brain I have swollen ankles. Where is the sense in that? A fat ankle – one that is as thick as the person’s calf, such that there’s no visible anatomical difference in the two. From “calf” + “ankle.” Usually used in the plural. 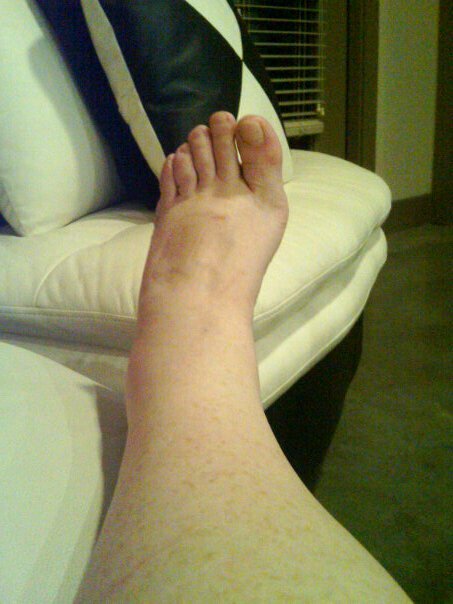 I’m special…I only have one cankle tonight. And it doesn’t always look like this. Normally, I have ankles. So I am just gonna sit back and relax and put my cankle up. WAY UP! and see if it can’t find a way to return to normal all on it’s own. Hopefully I won’t wake up with a knalf or worse a vagiknee. Tomorrow is another day…And I wouldn’t miss it! I love each and every one of you and your cankles!